What I love the most about being the guy who's into music and doing the website thing is that people often come to me to tell me about new artist - some I listen to, some I don't, some I love... What's even cooler is when I'm tired of listening to all the music I have and no one is posting anything good I get a email with a link to these guys music. Specifically the song up above which is a remix to one of the more notable Biggie songs. Before I go into anymore I want to clarify the title. When I think it's appropriate to give someone more love then normal or I see or hear something that other mainstream sites aren't all posting at the same time I give it the OSTT stamp. The Reach is actually the name of the Aer's new album which is what I'm sharing with you in addition to the "Story to Tell" track above. 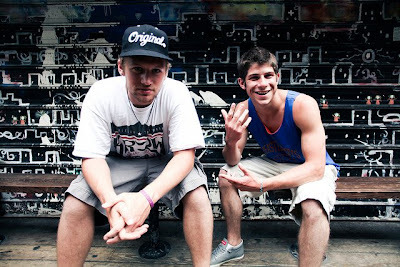 The Fresh Aer Movement is basically, well you get it by now and I dig it every artist has a phrase or movement now a days and I dig theirs. You can check out their website to catch up on all the remixes and videos they've done. Below I'll also provide a link to the album - I know your thinking wow it's on iTunes should he be giving a link out? Well put it this way they are giving links out and at this stage I think it's better to give it to you guys to get a feel for who they are "awareness" people. Then if you like go out and support! Overall I really like these guys they aren't trying to come out and be another Mac Miller, MGK, Asher Roth etc... they have a unique sound and its a crossbreed between Hip Hop & Pop sometimes I confuse myself with genres but you get what I'm saying. These guys could do magic in the future, they just need the right ears and timing. If you like the song above you really won't be disappointed in the album. Last but not least thanks to Emma who shot the links my way. Also seeing this site is mainly based on fashion & lifestyle I figured I'd throw this cool fact in one of these guys brothers also owns a line of backpacks called George Guest. Head over there to check them out. Pretty pricey but nice high-end looking backpacks. Seems like that family isn't doing too bad for themselves. ENJOY!